I’m an information forager, someone who wanders among topics picking up bits and pieces of knowledge as I go. If you offer me a good way to gain information and experience, you’ll get my attention. I’ve sort of fallen in love with the Massive Open Online Course (MOOC) offerings from Coursera. I’ve successfully completed seven of the courses, ranging from an easy introductory course on geospatial information and mapping to a challenging course on machine learning. I bit off substantially more than I could chew when I signed up for a natural language processing class, but at least I had the good sense to pack it in when I saw I didn’t have the skills to complete the assignments. One of my just-completed courses was Model Thinking, by Professor Scott Page from the University of Michigan and the Santa Fe Institute. This session was the second time the course was offered and, as it turned out, it was an exact repeat of the first session. Dr. Page and his assistants didn’t update any of the lectures (or even edit out coughs and other flubs from original recording), participate in the class’s discussion forums, tweet from the advertised Twitter account, or update the class’s Facebook page or blog. As befits a summer offering, the class ran entirely on autopilot. We’re very early in the days of MOOC development, so there are a lot of experiments going on as professors and institutions determine how to present MOOCs and incorporate them into university curricula. One of the big problems MOOC providers have to face is the immense number of individuals who sign up for the class but never watch a single movie. In some cases, only a third of students who sign up for a MOOC watch even one lecture, and most courses have pass rates of less than 10% (7% is typical). Part of the problem is that there’s no real penalty for not finishing the course — you know you didn’t do the work, but there’s no social stigma attached to it. And besides, you can always download the movies and watch them at your leisure. Dr. Page seemed to address this dropout issue by making the Model Thinking class very easy to pass. Grades were calculated by adding 50% of your quiz scores (dropping the lowest two) and 50% of your exam scores, with everyone who scored a total of 75% or higher receiving a certificate. But here’s the kicker: you got three attempts at each quiz and the system displayed the correct answers after you took the quiz for the first time. All students had to do was write down the answers and re-take the quiz to get a perfect score. Like the quizzes, you got three shots at the mid-term and final, but the system didn’t display the correct answers. It did tell you where to find the information required to answer the question, but you had to figure out the answer for yourself. Even so, if you received a perfect score on the quizzes (hard not to), you only had to get half the exam questions right to pass. The only reason a mildly attentive student couldn’t pass the course would be a lack of time to take the quizzes and exams. You barely needed to watch the lecture movies. Is this strategy a good way to improve MOOC completion rates? Yes, if that’s your only goal. I would be very interested to learn how this Model Thinking class session’s completion and engagement rates compare to those of other MOOCs, but I wonder how much material students who took the easy route retained. If there’s no significant marginal cost per technically passing but unengaged student, perhaps it’s OK if they take little or no knowledge from the course. At the very least, it’s a worthwhile experiment. Virgin Atlantic Little Red, a U.K. domestic rebranding of Virgin Atlantic, will feature “in-flight gigs” on selected flights that include live music and improv comedians. Entertainment will take place on flights headed to Edinburgh and Manchester, and performers will be selected from the talent pool at the Edinburgh Fringe Festival. But here’s the kicker: While the acts will be mentioned on Virgin Atlantic’s Facebook and Twitter pages, the flights they will be performing on will be a surprise. We’re guessing that business travelers, improv comedy, and a confined environment will be a volatile mixture, but that’s just us. I do improv and stage magic and think I’m pretty entertaining, but I only take a few strolling mentalism gigs at company parties a year. I want to be sure I’ll be a good fit and often look for reasons to break off from a group early rather than overstay my welcome. I don’t want to be what sports commentator Joe Buck refers to as “the guy at parties who insists on doing card tricks no one wants to see”. I don’t mind stopping to watch a street performer for a few minutes. 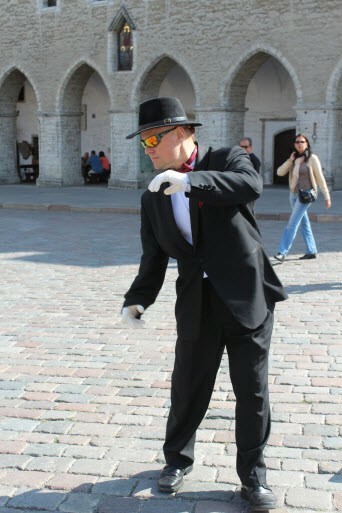 In fact, I tipped a terrific human statue when my wife and I were in Tallinn, Estonia, in July. I’d rather donate three pints of blood in an hour than be on a flight with a live musician or improvisers. I’m one of you, guys, and I don’t begrudge you the money, but I will not interact with you. I think someone in Virgin corporate learned the wrong lesson from the funny PA announcements some Southwest flight attendants make. Those presentations work because they’re fast, they’re hilarious, and they’re over. My previous set of posts described elements of gamification (such as meaningful choices and conflict) and how to incorporate them into business and improv. Kevin Werbach and his coauthor Dan Hunter also identify six steps to gamification (For the Win, p. 86), which I think provide an excellent framework for business and theatrical endeavors. I took a wild stab at designing for fun in my last post. In this post, I’ll talk about deploying the appropriate tools. Deploying the appropriate tools is where the cool concepts you’ve brought together become a system you can poke, prod, enter data into, and get feedback from. If you’re measuring data entry, you can automate the process. If you’re measuring geographic information or activity, you might program a mobile app to capture the data automatically. Otherwise, you need to create a system that combines automatic data collection with user entry. The specifics will change based on your environment and resources, but bear in mind that almost any system will require a significant investment of time, money, or both. In an improv context, deploying the appropriate tools occurs in the context of creating your show and presenting your product. How you present your performances, from your venue to your costumes and format, shapes your audience’s expectations and reactions. Much improv comedy happens in restaurants, bars, and other spaces where the performance is secondary to the venue’s revenue stream. The venue often provides the space in exchange for a little rent or in the hope that the performers’ friends will eat and drink during the show. All the performer needs to do is put on their dark colored top, jeans, and soft-soled black shoes to get going. Troupes with dedicated spaces must pay attention to audience seating, bathroom access, and availability of snacks, drinks, and swag to buy at the performance. You also have to create feedback mechanisms for the audience and performers. As I’ve said in other contexts, the audience isn’t there for the performers’ sake — they attended the show to have an enjoyable night out. Even your best friends wouldn’t see more than one show if the experience was so dire they didn’t enjoy themselves. You can get feedback from troupe members sitting in the audience and, in addition to watching the show, paying careful attention to the audience’s reaction. It’s easy to develop “laughing ears” where every reaction, regardless of how small, seems like a standing ovation. A teammate in the seats can help you see and hear what the audience really thinks. It’s your job to listen.